The 2018 Mr and Miss Durban University of Technology (DUT) students have once again done the University proud by winning the titles of Mr and Miss SA Campus 2019 competition over the weekend. 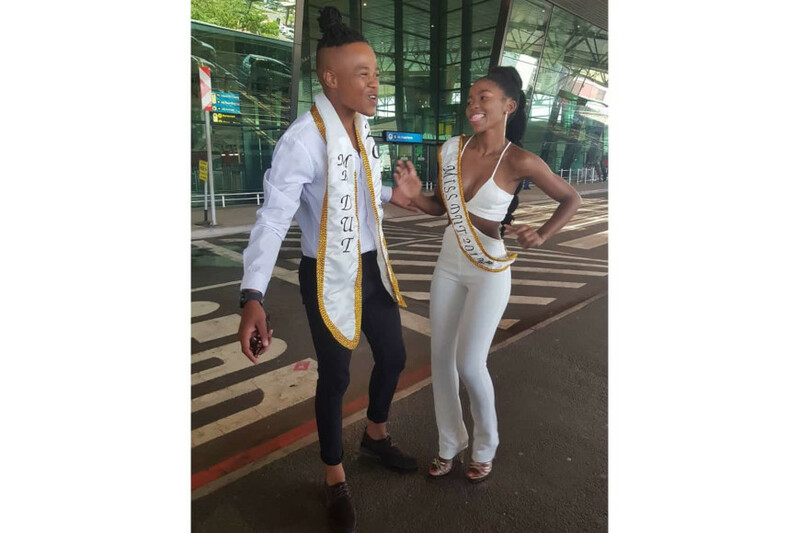 Miss DUT, Zabelo Hlabisa was crowned the 2019 Miss SA Campus, while Mr DUT, Siyavuya Ndimeni clinched the title of 1st Prince title at the competition held at Hatfield in Pretoria on 19 January 2019. Prior to this, Hlabisa represented South Africa in Indonesia at the prestigious Miss Tourism Wordwide and she was second runner-up. According to Hlabisa, her modelling journey whilst at DUT, has challenged her to be a great, strong woman who is not dependent on others but who must always be focused and able to overcome any obstacle that stands in her way of being the best at all that she does. “I had to go through some hardships in my modelling career and life but that was just to teach me that nothing in life comes easy,” said Hlabisa. Although Hlabisa has been disappointed plenty of times in her journey as a model and at times felt she was not good enough, prayer and motivation from the likes of former Mr DUT, Nkululeko Mbatha and the support from her family and friends has kept her going. “Little did I not know that if I had listened to my negative instinct in 2018 and defied Mr DUT 2016’s advise to enter once again for Miss DUT; I would not have not been crowned Miss SA Campus in 2019. At times I have had to believe in myself even when it was the most difficult thing to do,” added Hlabisa. While Hlabisa has had it tough in her journey, for Mr DUT, Ndimeni it has been the latter. Ndimeni was scouted in Cape Town in 2013 by a modelling agency, from that time he did not look back. Ndimeni who has been a model for more than five years says his journey has been filled with excitement and been a fulfilling one. “My first agency was Men’s Division in 2013 and I remember my first job as a model was with Samsung. I then changed agencies a couple of years and joined 10 Artist Management which is represented by 20 Model Management,” explained Ndimeni. Ndimeni says being crowned Mr DUT has been one of the greatest highlights of his life. “After being crowned Mr DUT, I have received so much love from people. I have also been invited to be a judge at different beauty pageants, so it has been such an amazing journey,” he said. Just like Hlabisa, Ndimeni overcomes his challenges by praying. “My spirituality has given me an understanding that all problems are not mine to claim but God’s, men’s intelligence and strength might waiver but God’s abilities are eternal. It is by God that I have been able to win Mr DUT and be crowned 1st Prince, one of the titles that mean so much to me,” he said. Both DUT stars are not only excited about their titles but they have also vowed to give back to their communities by using what they have not only learnt at DUT, by being Mr and Miss DUT but using a combination of all their experiences. “I am currently working on a programme to train boys and girls who aspire to be models,” said Hlabisa. Whilst Ndimeni aspires to use his academic knowledge by creating his own content television and creating his own beauty pageants as well as work on presenting skills. Siyavuya Ndimeni is in three words: Melanin, happiness and spirit. Pictured: Mr and Miss DUT having the time of their lives as representatives of DUT.